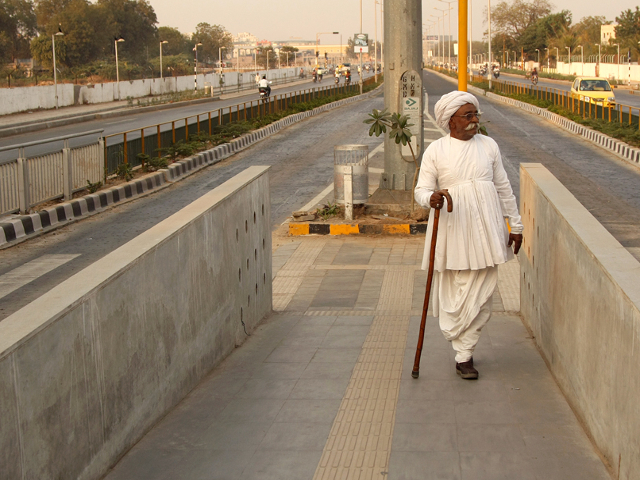 A man boards the Janmarg BRT, one of the many advanced bus systems proliferating throughout India. Photo by Meena Kadri. On Saturday, June 1, Bhopal, India became the most recent city to debut a bus rapid transit (BRT) system, during the trial launch of the first section of a 23 km (14.3 mi) corridor to be fully completed later. Despite complaints of traffic problems during construction, the 6.7 (4 mi) section of Bhopal’s BRT was completed successfully and on time, in part due to strong political leadership, help from experts in BRT construction, and the recent launch of Indore’s successful BRT system. Bhopal is the capital of Madhya Pradesh in central India, and the second largest city of the state with a population of 1.9 million. Currently, 150 city buses form the primary public transport system in Bhopal, supported by mini-buses and shared auto-rickshaws. Funding for the BRT corridor is provided by the Central Government of India under its flagship JnNURM investment program, and will help city buses bypass traffic congestion, providing faster, more reliable transport for the people of Bhopal. During the trial run on the short section, buses traveled the length of the corridor at an average speed of 12.4 miles per hour, a 27% improvement over the speed of the current city bus service. In short: the new BRT line will leave people with more time to work or spend time with their families. Under the watchful eye of administrators and planners, buses ran along the 6.7 km stretch from Regional Research Laboratories to Misrod, a southern suburb of Bhopal. The larger 23 km corridor, intended to be the full Phase I of the Bhopal BRT project, will extend from Misrod to Bairagarh, Bhopal’s central train station, and run through the core of the city. This route through the central business district sets Bhopal’s new line apart from most of India’s BRT systems, which are designed primarily to serve the suburbs. The successful launch of an 11.4 km iBus corridor in Indore, the economic hub of Madhya Pradesh, has played an important role in catalyzing the launch of Bhopal’s BRT line. The inaugural phase of Bhopal’s advanced bus system has been five years in the making, and marks the second BRT system in the state of Madhya Pradesh. The rapid completion of the 6.7 km section of the BRT demonstrates the advantages of strong political leadership. Despite complaints that construction of the line was causing traffic problems and congestion, BCLL (the city transit management agency) persevered and the project was completed on time. By focusing efforts on the completion of the initial 6.7 km section, BCLL was able to quickly debut the line, and begin trial runs. Within the next three weeks, the section will be fully operational. Meanwhile, the city is already working towards completing infrastructure on a second portion of the corridor. On the morning of the launch, representatives from EMBARQ India assisted local officials in getting operations off to a smooth start and establishing parameters for data collection, system analysis and improvements. Their expertise in launching BRT systems helped to make the project go smoothly. With this launch, Bhopal joins the ranks of Indian cities with advanced bus transit. There are currently thirteen cities in India with BRT lines which are either operational or under construction. Eight additional cities are in the planning stage. For India, a country with a growing population and ever-present traffic woes, BRT systems may provide much needed relief.